Make your time and efforts last, use Aero Glue and Flock. High quality Nylon Fibers are colorfast, durable, water resistant and fade resistant. Perfect for outdoor use! Kits are priced as a better buy, unless you are doing apx. 64 or more decoys. Flocking Fiber- sold by weight and Ure-Glue is sold by ounces. The weight may be the same, but the fiber volume is 3+ X the glue! Use for crafts, decoys, fishing rods, toys and décor. Nylon is abrasion resistant & does not bleed when wet. Pair with Aero Ure-Glue for long-lasting results. Flocking emulates real feathers and had similar UV properties. White paint under UV light turns black, which flock while hold its color. Easy process. Download the PDF color guide. Coverage Est. : Varies due to application process & re-use of loose fibers. 16 oz or 1 pound, for 4-6+ doz goose big foot heads. Our testing- 2 oz flocking covering 9 sq feet flat surface, 1 coat, allowing for no drift/loss; Therefore 16 oz cover apx 72 sq feet. Coverage is always a variable, depending upon the glue absorption, the application & if loose fibers are recaptured to use again. Aero tests with varying colors of glue to accent the flock. Such as the Canvasback breast should use brown glue underneath. A different color of glue gives the finish product a more realistic color, instead of a plain color block of flock. Some custom colors can be done in-house; if not it would require a minimum special order of 150 lbs. Indicate Quantity FLAT RATE SHIPPING CHART BELOW- Ship Monday only Feb - August. Mon & Wed, Sept to Jan. If realism matters- then buy for Mallard Mix- Includes sheen fibers. Super Black Nylon Fibers, 4oz - 45004 - $13.99 Super Black Nylon Fibers, 8oz - 45008 - $17.99 Super Black Nylon Fibers, 16oz - 45016-S - $22.99 LIMITED TIME SALE! BEIGE - BROWN Flat rate shipping chart bottom of page- not included in fiber cost. Mallard Flank Custom Nylon Fibers, 4oz - 42104 - $15.99 Mallard Flank Custom Nylon Fibers, 8oz - 42108 - $21.99 Mallard Flank Custom Nylon Fibers, 16oz - 42116 - $29.27 NEW updated color! Mallard Breast Custom Nylon Fibers, 4oz - 43504 - $14.99 Mallard Breast Custom Nylon Fibers, 8oz - 43508 - $18.99 Mallard Breast Custom Nylon Fibers, 16oz - 43516 - $25.99 NEW updated color! MISC COLORS Flat rate shipping chart at bottom of page- not included in fiber cost. Purple Rayon Fibers, 4oz - 47004 - $11.99 Purple Rayon Fibers, 8oz - 47008 - $16.99 Purple Rayon Fibers, 16oz - 47016 - $21.75 Rayon better for indoors. AERO Ure-Glue- EASY to use, long lasting adhesive we use on DropZones...so Ure-Glue was invented! Brush on or spray on if slightly deluted with water; tack sets quickly to expedite multiple color applications. Urethane base for a very durable long lasting finish, flexible/adjusts to harsh outdoor use & temperature changes- plastic shrinks & expands..
Waterproof & abrasion/wear resistant! Make your finish last, but using Ure-Glue. In testing, no other glue on the market held up like Aero's. 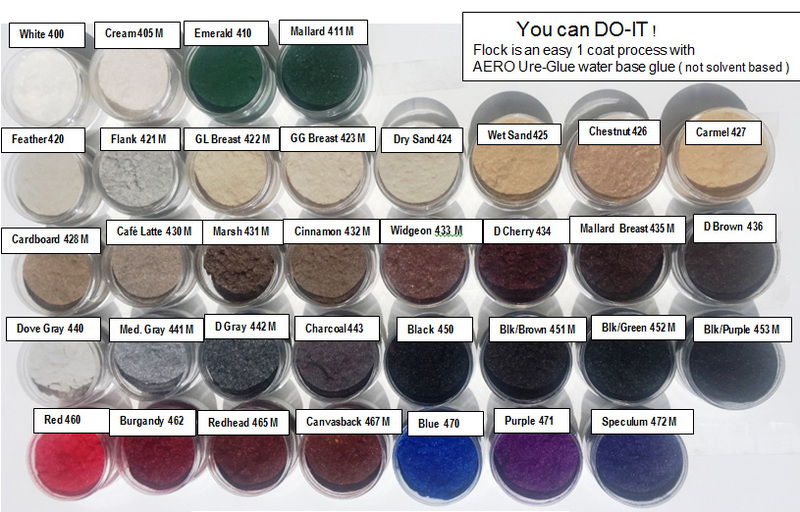 Purchase the glue color to blend/ match flocking colors to give the finished color greater realism. Example: usebrown glue under the canvasback to give the flock color depth and variance. A better finished look. Plus colored glue will allow wear spots to blend in and masks sparse applications flock..
Aero Ure-Glue works on almost all surfaces, which will accept an adhesive or paint. Test a spot & allow to dry before whole application. Some preparation/primer may be needed. Urethane properties: high abrasion resistance, elasticity to adjust to the plastic decoys during temperature changes & UV resistant- holds color. Very easy to use, no high fumes, not solvent based (which require respirators) and dries quickly. Don't use paints which are meant for flat surfaces. Estimate about 25% more glue than flock- Depending upon application technique. Sold by weight. Color darkens when dry. Do not Freeze. The Buy Glue has been moved here. Same Day 1000 Order and Ship on same day standard shipping- Expedite FEE: if order can be filled before freight is picked up. Next Day-Express 2000 Express shipping FEE. We will have to make a special trip to the airport. or 2nd Day, or if available Third Day ( availability for express delivery will depend upon the area). Flat Rate Shipping Chart for Flocking& small item products for 48 states, standard ground. Extra for Hawaii and Alaska. Not for decoys, blinds etc. $ 175.00+ Std. Shipping is FREE in 48 states. Extra will be added for Hawaii & Alaska. $2 Package Fee added to all orders. Oct- Jan: Products are shipped typically in 4 apx business days after receipt of order during season, predominately Monday & Wednesday , or sooner. During cold freezing weatehr, shipping will only be on Monday for packages containing glue. Feb to Oct: Products are shipped on Monday only.During holidays and vacations, the days may vary. $15.00 fee for COD orders. International orders will be charged actual shipping costs, plus $7.00 for extra packaging and extra paperwork required. Expedited shipping is available, but extra fees apply. Same day shipping for $7.00 extra, if possible. One Large Flat Rate Box holds apx 4 pounds of flock only. This ships to NZ for $80 apx. Professional fibers & Aero's Specialty Glue Just fibers & glue. More product info at the top of this page.
. Call our office (509) 545-8000 for pricing and to order. Disclaimer: All recommendations for glue and fibers are believed to be reliable. However, since the actual use of this product is beyond our control, no guarantee or warranty of any kind expressed or implied is made with respect to information presented and Aero Outdoors assumes no responsibility for use or misuse of the product and processes as described. Use with care and discretion; Aero Outdoors is not responsible for any personal or property damages, or any kind. Products are not for human or animal consumption. Ordering from this page creates an agreement to all terms and conditions.